DVD on program produced by KCPTV in Kansas City, MO, about Arthur Stillwell. Stillwell knew George Pullman well, and Pullman invested in Stillwells Oyster Car. 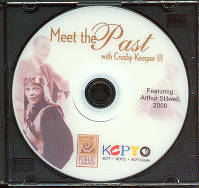 Description DVD on program produced by KCPTV in Kansas City, MO, about Arthur Stillwell. Stillwell knew George Pullman well, and Pullman invested in Stillwells Oyster Car.